There's so much to share about our trip to the Dominican, that I'm breaking it into segments. Part II will be about our week in Luperon. Possibly another post about the cost of things in the DR. Stay tuned. 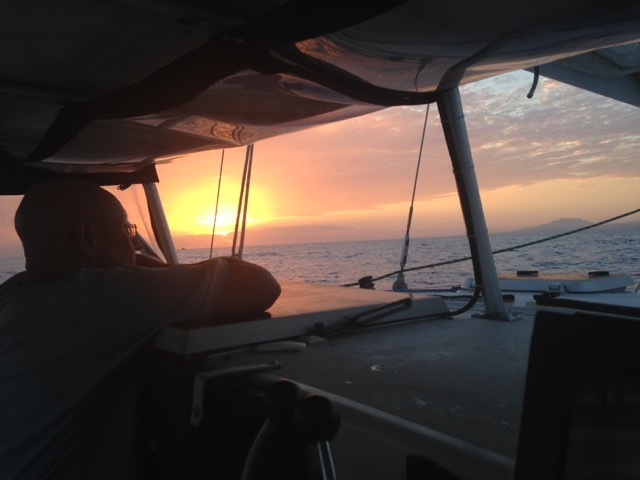 South Caicos to Luperon: We're up too early and eager to go. We lost a day yesterday, so we're skipping Big Sand and going direct Luperon--100 miles. 24 hours. If we leave too early, we'll arrive at Luperon's tricky entrance before daylight. The group of sailboats ahead of us are posting positive experiences in the DR, so we're getting excited. I send a message over to Kelly Nicole that we're leaving at 8:00 am. As I motor off the anchor, I see what looks like a waterspout outside the harbor. We creep forward until is dissipates and make the turn as Kelly Nicole raises anchor & hoists the main. We have 3 kts of current coming into the mouth at the tidal rage. They clear the harbour 0.4 behind us, but quickly pull ahead and unfurl their jib. They ride next to us for the first hour with winds SE @ 12--not good. We're waiting for a wind shift. We unfurl the genoa, turn 10 right, and shut the starboard engine off. 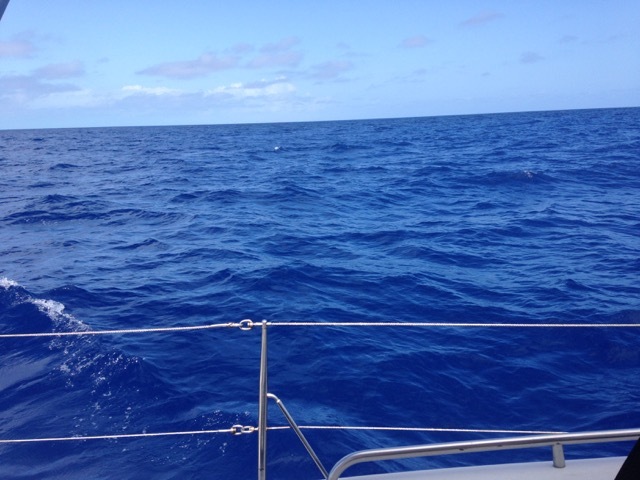 We're making 4-4.5 kts with 1-2 ft swells on the nose. By 9:30 am we have Big Ambergris in sight. The wind has slowly started to shift E allowing a turn 10 degrees back left. After two tacks east, we still end up just off Whale Breaker on a 190 COG (course over ground) at 3:00 pm. (On this heading we may miss Haiti! No bueno.) 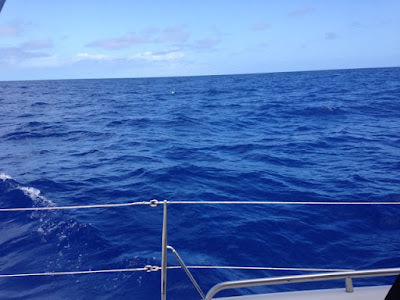 The wind lessens to 7-9 kts, but never enough to furl the genoa and turn back towards our course line. Kelly Nicole tacks, we tack, we pass them, they pass us. I head down below for a nap at 5:00 pm, as we are slowly turning back towards Luperon. I'm awoken by Amelia staring at me from the table. She wants her water cup, which she immediately tries to knock over. I make new blend of English breakfast tea & ginger tea with sugar as I head out for my shift. By 8:00 pm, we are back on a 160 course, Kelly Nicole 2.5 miles ahead with 14 kts off our beam. Amelia wakes up Daddy & successfully dumps the water on the guidebook. She loves overnights. There's always somebody in the salon to cuddle with and give her snacks. By 2:00 am, the wind is still 15 kts off our beam instead of dying as forecast. That's good. However, the sea is like a curvy, hilly country road with railroad tracks, potholes and rumble strips. Gheez. Hard to sleep. The Captain describes it as someone banging on the bridge deck with a hammer. There's a cargo ship coming up behind us. By 3:00 am, the wind has shifted back SE. I spot a red light in front of Kelly Nicole. Is that traffic or land? 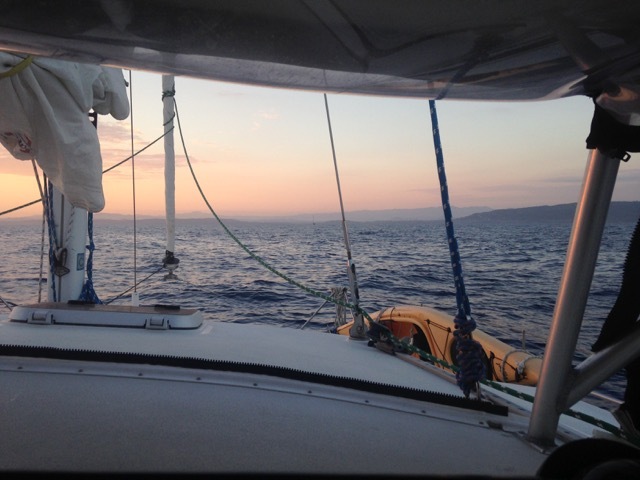 We turn back to starboard for a wind shift. At 4:30 am, a 1000-ft passenger ship appears on the AIS. I'm awake! And this is what we do all night. As the sun creeps above the horizon, The Captain starts to see the mountains of Hispanola. I pop out about 6:00 am and can clearly see the mountain range of the Dominican. I wasn't able to get a good photo. It reminded me of the Smoky Mountains except it was different shades of pink & purple. The harbor entrance is difficult to pick out, and the island, much bigger than the other's we've visited makes it feel like forever to motor the last 5 miles. With Kelly Nicole on point, we try to make sense of the channel markers, ultimately ignoring them and following our chart plotter (does that mark the channel? Where's the other marker? Or is it marking the shoal? The first set of markers weren't on either chart and the second one, appeared orange instead of red, probably marking the shoal of our port side.). A fisherman ducks between us and drops a fishing net. Really? As we round the first corner we see a huge clump of boats. "Uh, oh. Is it that busy here?" There's no backup anchorage! No, that's just the outer portion of the harbor. Then the harbor opens up in front of us and is packed! It's been a month since we left the busy anchorage in Georgetown. Culture shock. 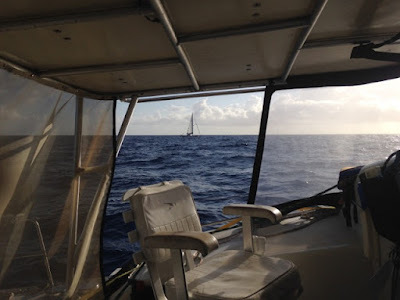 We creep along behind KN, eyeing a few possibilities and looking for a spot to turn around when a small runabout approaches Kelly Nicole. He seems to point out a spot to them, so we wait. Papo approaches us and says, "Mooring? $2/day?" The Captain says, "Sure." Wait a minute. We don't know how they're secured? Could be a cement bucket? "I'm tired and I don't want to clean our chain. We'll consider moving tomorrow." Papo leads us to a mooring and hands the line up (At some point, I realize this is my first time at the helm while picking up a mooring! It doesn't matter, though, we're creeping along so slowly that we'll glide to a stop well before we reach the mangroves and could only "love tap" another boat). He asks if we need a Dominican flag for $10! YES! He's won me over. We left woefully unprepared on the courtesy flag front, hoping to pick them up as we go. Papo heads back to Kelly Nicole, who is pointing over our way, "Hey, they got a mooring?!" 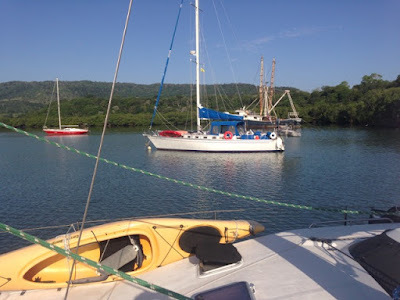 They have a manual windlass and muddy anchor--but are soon headed to the mooring next to us. Hey, neighbor! We straighten up the boat and Papo returns with a young customs officer in his Navy dress whites and his armed guard (who looks 14, but with a holstered 9-mm beretta). He comes straight into the salon & sits down. The Comandante speaks good English with a heavy accent. "I was at church and today is our Independence Day." He welcomes us to his country, takes some pictures of our passports and points us into town to complete Immigracion. We head over and tie up next to the other dinghies at the half sunk dock and head in. It's supposed to be a 5 min walk, so we walk right past the offices at the gate and end up finding Wendy's, a cruiser bar with wifi, where they point us back to the gate. Immigration speaks little English and we pay $90 (overtime?) and are advised to finish up with the harbor master, tourist cards and Agriculture on Monday. Kelly Nicole catches up and we back head back to Wendy's, where the el Presidente comes in 24 oz for 125 pesos/$2.85. There is a gato that has her own bar stool and The Captain ends up with an adorable perro under his chair. They point us onto de la France for lunch. On the way back, we meet the oficial who provides our Tourist Card ($10 each) and who speaks excellent English ("You understand my English?" Si. Big smile). The Captain is asleep as soon as he hits the couch.